1. Melt the butter in a pan over a medium heat. Add the flour and cook for a few minutes, stirring, until lightly golden. Gradually add the milk, stirring, until you have a smooth thick sauce. Add the ham, mustard, parsley and season. Cool. Chill for 2-3 hours or overnight until firm. 2. With wet hands, shape the mixture into 15 walnut- sized balls. Dust all over with the extra flour, then dip in the egg and roll in the breadcrumbs. 3. Pour 6cm oil in a deep pan and heat to 170°C. If you don't have a thermometer, drop a small cube of bread into the oil and when it turns golden in 30 seconds, the oil is ready. 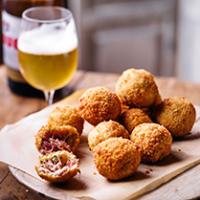 Carefully fry the croquetas, in batches, for 4-5 minutes until golden, crisp and piping hot in the centre. Use a stainless-steel skimmer or slotted spoon to lift on to a plate lined with kitchen paper, and serve.